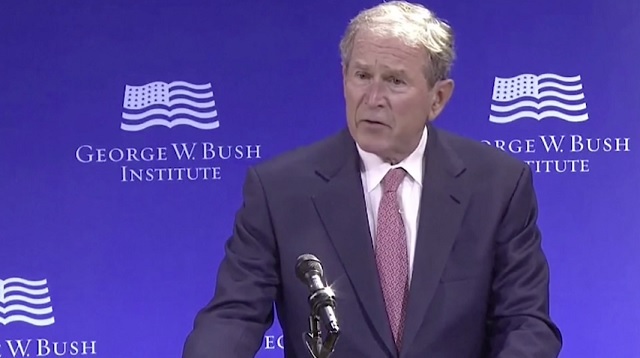 George Bush came out of retirement Thursday to “indirectly decry Trumpism” and label all those opposed to open borders globalism as bigots, nativists and white supremacists. While Bush was fine staying silent throughout Obama’s hyper-divisive eight years, he gave a speech attacking Trump one year ago during the election while pushing his 1 percenter (poll wise) brother Jeb. It had zero effect on the polls and Jeb dropped out of the race shortly thereafter. Bush’s father George H.W. Bush told Democrat Kennedy Townsend he was voting for Hillary Clinton. The biggest conspiracy theory of the last two decades was George W. Bush’s claim that “Iraq has WMDs,” which led to 1 million dead Iraqis, the rise of ISIS and the refugee crisis. The rise in so-called “bigotry” in America and Europe is directly related to the massive flooding of our countries with hostile foreigners, largely thanks to Bush and Obama’s Middle Eastern wars and open borders policies. Translation: we need to keep the borders open, the displacement immigration flowing, and the wars ongoing. Our identity as a nation – unlike many other nations – is not determined by geography or ethnicity, by soil or blood. 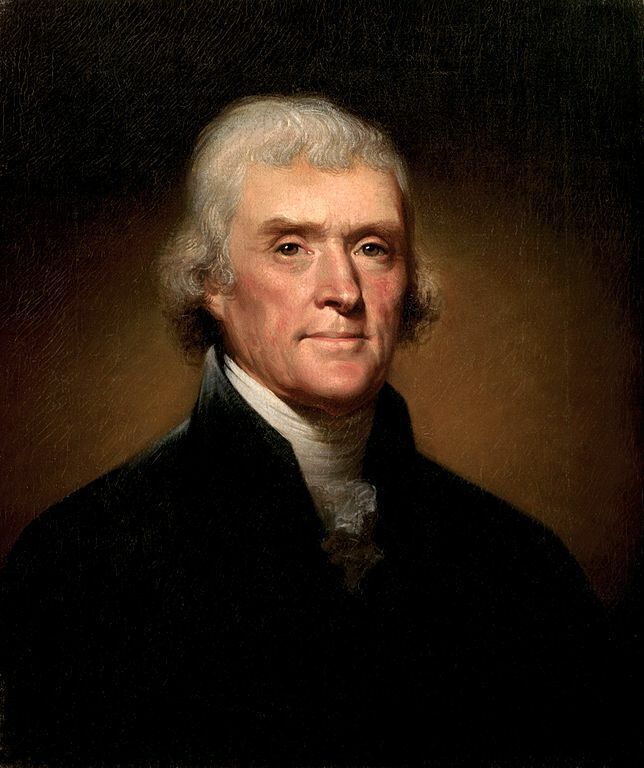 Being an American involves the embrace of high ideals and civic responsibility.We become the heirs of Thomas Jefferson by accepting the ideal of human dignity found in the Declaration of Independence. We become the heirs of James Madison by understanding the genius and values of the U.S. Constitution. We become the heirs of Martin Luther King, Jr., by recognizing one another not by the color of their skin, but by the content of their character. This means that people of every race, religion, and ethnicity can be fully and equally American. It means that bigotry or white supremacy in any form is blasphemy against the American creed. And it means that the very identity of our nation depends on the passing of civic ideals to the next generation. Thomas Jefferson and James Madison owned slaves. Was America founded by “white supremacists” or by egalitarians? Are our Founding Fathers “blasphemous white supremacists” who lived contrary to the loosely defined “American creed” you just made up? In fact, the entirety of America is on decline because of the policies you, Obama, Clinton and Papa Bush all embraced. 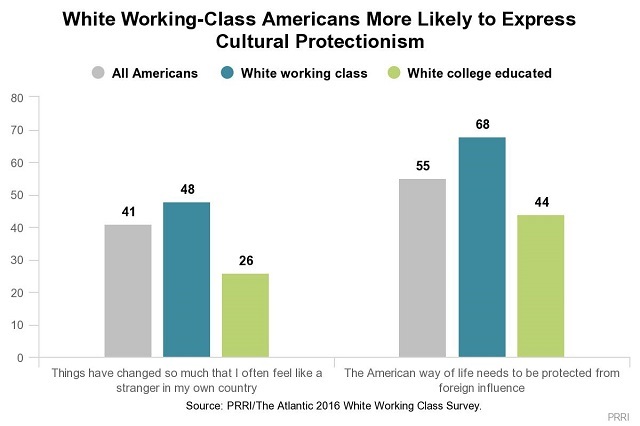 This whole issue comes down to the fact Americans are divided on the core of America’s identity. Bush and our cosmopolitan ruling class belong to the 26%. They believe Americans are not a unique people with a rich history but interchangeable cogs that should be replaced as soon as they fail to advance the interests of the ruling elite.